We are very happy that the Swiss National Science Foundation (SNF) will be funding the HEADWIND project. Together with colleagues from the Department of Diabetes, Endocrinology, Clinical Nutrition, and Metabolism, Inselspital, Bern University Hospital (Prof. Dr. med. Christoph Stettler, Dr. med. Markus Laimer and Dr. med. Thomas Züger), the Bosch Internet of Things Lab (Prof. Dr. Felix Wortmann) and the Chair of Management of Information Systems Group at ETH Zurich (Prof. Dr. Stefan Feuerriegel), we will develop an in-vehicle hypoglycemia warning system. Advisory board members of this project are David F. Kotz, PhD, Champion International Professor, Department of Computer Science, Dartmouth College and Core Director at the Center for Technology and Behavioral Health (www.c4tbh.org), Dartmouth College and Roman Hovorka, PhD FMedSci, University of Cambridge UK, Director of Research, Institute of Metabolic Science (www.ims.cam.ac.uk), University of Cambridge, Charles University Cambridge, UK. Diabetes mellitus and its associated complications represent an important challenge to society and the health care systems globally. It is estimated that currently 425 million adult patients suffer from diabetes, and that this number will increase to over 640 million by 2040. Despite ongoing developments in the treatment of diabetes, hypoglycaemia remains one of the most cumbersome acute complications. 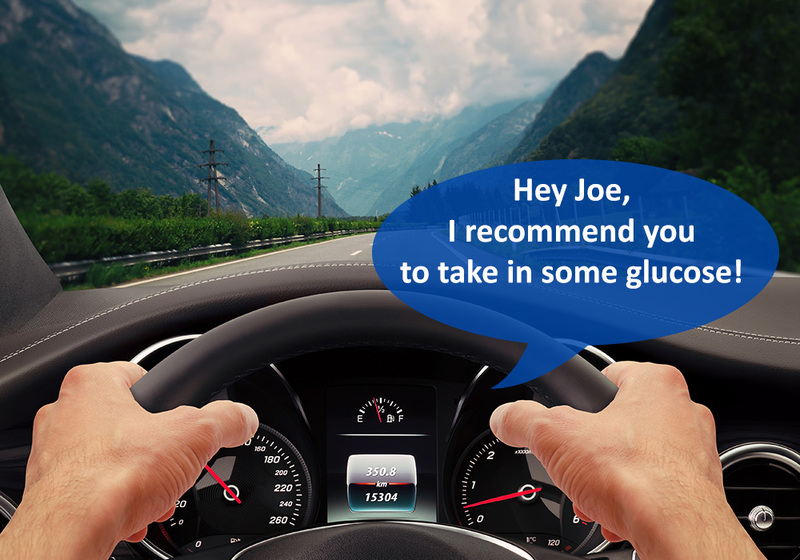 Hypoglycemia affects neuro-cognitive and psychomotor function and is associated with a significantly increased risk of driving mishaps and accidents. The current state of research regarding prevention of hypoglycaemia-associated accidents is, unfortunately, still limited to rather general insights, while interventional approaches are urgently needed. We, therefore, propose to apply state-of-the-art machine learning to neuro-cognitive and psychomotor function, automotive parameters, and physiological markers to reliably detect hypoglycaemia and give early and effective warning. Our project aims at designing, implementing, and evaluating an on-board vehicle hypoglycemia warning system (“HEADWIND”). The overall goal is to detect hypoglycemia in an early stage with high accuracy using a sensing module and then to trigger direct interventions through a support module. For this purpose we will study diabetic patients under hypoglycemic conditions induced through so-called clamp technology, first in a simulator setting and second in field studies in a real car setting (closed driving track). High-resolution real-time driving data and physiological sensors will be algorithmically integrated with video streams of drivers’ facial expression to detect hypoglycaemia.